Since the public meeting in March, the consultants to the development held a further series of exhibitions and have redesigned their plans. Changes include cladding the buildings in brick rather than stone so as to fit in with Corpus Christi Church and Brixton Hill Court on either side. The sports facilities appear to back onto fewer houses and the sports hall height has been reduced. More detail regarding transport is also available, including support for a new crossing on Brixton Hill. There is concern regarding vehicle access during construction – it is proposed to be directly from Brixton Hill, raising fears of greater congestion, but potentially better for residents of Horsford Road. More detail on the current designs is available at www.brixtonhillcampus.com. Residents will of course still have serious concerns, including about the large number of people using the site each day and about the partners involved in the Campus. It is, however, important to have detailed comment from residents about the detail as well. Feedback is requested via a Feedback form, which can be returned via email to information@brixtonhillcampus.com by 29th June (today). 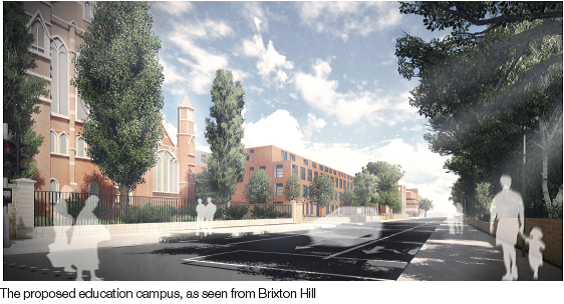 This entry was posted in Blog and tagged Brixton Hill, Horsford Road, Lambeth College, planning, South Bank UTC, Trinity Academy by Martin Tiedemann. Bookmark the permalink.